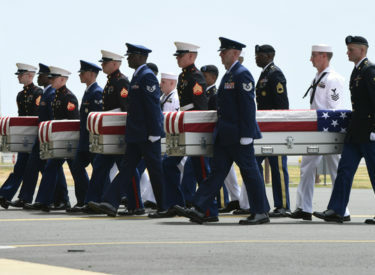 OKLAHOMA CITY (AP) – Funeral services are this weekend in Oklahoma for two Korean War soldiers whose remains were recently identified. Services will be Saturday in Idabel for Army Pvt. Charles Kaniatobe of Idabel and on Sunday in Bokchito for Army Pfc. Mathis Ball Jr. of McKinney, Texas. Kaniatobe was 21 when he disappeared July 10, 1950, during combat near Chonui, South Korea. Ball was 20 when he disappeared two days later during combat near Choch’iwon, South Korea. The remains of both men were recovered in 1950 and were sent to Hawaii but remained unidentified until recent DNA testing. Both men were part of the 21st Infantry Regiment of the 24th Infantry Division. Kaniatobe was with Company A 1st Battalion, and Ball with Company M, 3rd Battalion.